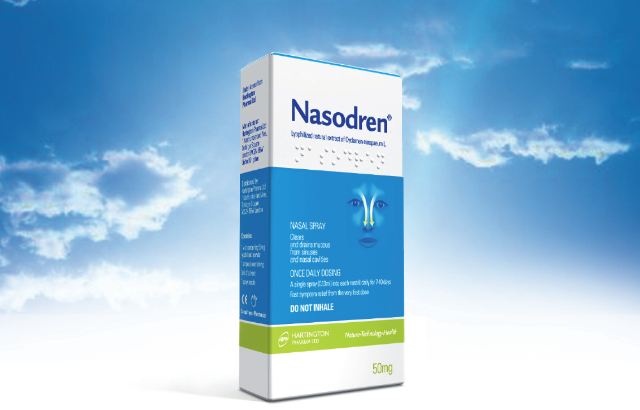 Nasodren for Sinusitis Treatment: What does cause constant sinus congestion? Sinus congestion refers to an obstruction in the sinus air passages. A sinus congestion that persists for long time is called constant sinus congestion. Symptoms of the congestion include a sensation of pain, pressure or fullness on the part of the face over the sinuses. The pain is generally unilateral. The sinus congestion can be acute and chronic. Both medical conditions and medicines may also contribute to the congestion. Mucociliary dysfunction and / or nasal polyposis may cause the congestion. What constitutes mucociliary dysfunction is not fully clear yet. However, the dysfunction means a combination of disorders that are genetically related. Atypical feature of the disorders is dysfunctional sinonasal mucociliary transport. Acquired mucociliary dysfunction is ascribed to trauma, chronic inflammatory disorder, smoke inhalation, and viral rhinitis. Sinonasal polyposis, called nasal polyposis, is bilateral. An obstruction, injury and chronic mucosal inflammation may cause polyps. fever causes sinus congestion. The patients who have to spend long period in bed are also prone to sinus congestion. Chronic dysbiosis (imbalance between good and bad bacteria within the body) in the sinuses and small intestine may also lead to chronic sinus congestion. An overdose of antibiotics may cause dysbiosis by encouraging growth of bad bacteria. Recently, the European Commission (E.C.) approved KALYDECO by Vertex Pharmaceuticals Incorporated for cystic fibrosis patients living in the European Union. The medicine is developed for the patients of >=6 years old and the patients having the cystic fibrosis transmembrane conductance regulator (C.F.T.R.) gene with a G551D mutation. However, the medicine has some adverse effects such as sinus congestion, dizziness, diarrhea and stomachache. A non-stimulant prescription drug, Strattera (atomoxetine hydrochloride) administered to the patients suffering from attention deficit hyperactivity disorder (A.D.H.D.) may cause sinus congestion. Metolazone (Zaroxolyn, Mykrox and Diulo), used to treat moderate hypertension and edema secondary to renal disease and heart failure, has several adverse reactions, including depression, insomnia, pain in abdomen and chest, dry mouth, diarrhea and sinus congestion. Etoposide (Vepesid) is an anti-cancer medicine. The drug is mainly used for Hodgkin’s lymphomas, testicular cancer and small cell lung cancer. Both solution and capsules of etoposide are available in the market. Mild side effects of the drug include watery eyes, running nose, poor appetite and sinus congestion.